elobau sensor technology Inc. announces a new programmable safety controller eloProg for the machine safety market. eloProg is designed for the monitoring of specific machine inputs such as photoelectric sensors, light curtains, magnetically operated sensors, emergency stop buttons, safety mats, etc. and then allowing the user to program the function of these inputs using icon-based software (in a Windows environment) to create specific logic to control the safety outputs. The modular safety system monitors and evaluates signals of machine safety applications on machines and in production facilities. The flexible configuration allows the inputs to be used for a range of functions, e.g., for a 2-hand control or to connect an emergency stop button. The eloProg base module can be combined in multiple configurations with other modules to extend the inputs or outputs. 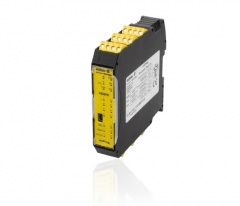 The base CPU module can be operated as a safety controller without any additional modules. However, when using the additional devices, the base module can be extended to up to 72 safety inputs with a total of 8 OSSD (output signal switching device) outputs. For easy integration into plant control, fieldbus modules Profibus, CANopen or DeviceNet are available for diagnostics and monitoring. Bus connection plugs avoid cumbersome wiring of the modules together and the slim profile of the modules means the system can be configured in a minimum amount of space. As well, eloProg conforms to SIL 3, SILCL 3, PL e, Cat. 4.
eloProg has multiple I/O modules including 8 inputs and 2 transistor outputs on the main module and expansion modules that include: 8 input/2 output, 8 inputs, 16 inputs, 2 and 4 transistor outputs and 2 and 4 relay output modules. EloProg also has a mini memory card for easy transfer of a program from one safety PLC to another or to overwrite an existing program.